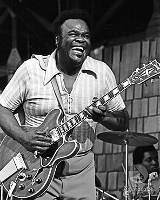 Guitarists ranging from Eric Clapton and Mike Bloomfield, to Peter Green, Jeff Beck and Carlos Santana have all acknowledged their debt to Freddie King (1934-1976), the “Texas Cannonball.” His ’60s classics, “Have You Ever Loved A Woman,” “Hide Away,” “You’ve Got To Love Her With A Feeling” and “The Stumble” are part of the DNA of modern electric blues. Born in Texas, a young King arrived in Chicago with his family in 1950, a perfect moment to start learning from Muddy Waters, Little Walter, Jimmie Rogers and all of the legendary post-war bluesmen. Over the next 10 years, as the First Great blues revival took shape, King developed a style all his own. In 1961, he miraculously charted six R&B Top 30 hits on the King/Federal label that were heard from coast-to-coast and were profoundly influential on both sides of the Atlantic. Three covers are indelibly etched: “Hideaway” featuring Clapton (on John Mayall’s Bluesbreakers, the ‘Beano’ LP of 1966), “The Stumble” and “Someday, After Awhile (You’ll Be Sorry)” (both featuring Green, on Mayall’s A Hard Road, ’67) and “Have You Ever Loved A Woman” (a staple for Clapton ever since the first Derek & the Dominos album). King thrived on rock, jazz and blues scenes and at festivals starting in the late ’60s and ’70s, even getting name-checked by Grand Funk Railroad on “We’re An American Band” (“Up all night with Freddie King/ I got to tell you, poker’s his thing”). Right up through his death, all too soon at age 42, Freddie influenced Stevie Ray and Jimmie Vaughan, and the next generation of disciples who would take electric blues into the ’80s, ’90s and beyond. Other 2012 inductees include The Small Faces/The Faces, Donovan, the Red Hot Chili Peppers, Guns N’ Roses, the Beastie Boys, and Laura Nyro. Also being inducted this year in The Award for Musical Excellence category is record engineer and producer Tom Dowd, whose name you might recall from his decades of work, largely for Atlantic Records, with such artists as Big Joe Turner, Ruth Brown, LaVern Baker, Rufus Thomas, Ray Charles, John Coltrane, Aretha Franklin, Solomon Burke, Wilson Pickett, Otis Redding, Thelonious Monk, the Coasters, Derek and the Dominos, King Curtis, the Allman Brothers Band, Cream, and Eric Clapton, to name just a few. In addition to engineering Atlantic’s first national hit in 1949’s “Drinkin’ Wine Spo-dee-O-Dee” by Stick McGhee, Dowd also worked with such blues acts as Booker T and the MG’s, Popa Chubby, Tinsley Ellis, Colin James, Joe Bonamassa, and Susan Tedeschi during his distinguished career. The 27th annual Rock and Roll Hall of Fame Induction Ceremony will take place in April, and is open to the public. For those who can’t make it to Cleveland, look for the ceremony on HBO in early May. This entry was posted in Awards and tagged Freddie King. Bookmark the permalink.